Finished 3rd in World Cup 2015 in Las Vegas. 17 h son of Vigo d'Arsouille is rapidly being recognized as one of the great young breeding stallions of his generation. This son of World Champion Vigo d'Arsouilles is also a product of Sauterelle de la Pomme, who was a great international winner under Patrice Delaveau and Philippe Le Jeune. 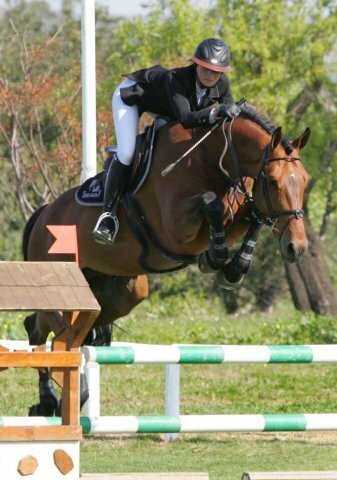 He is campaigned at 1.60m international circuit by Penelope Leprevost where he is competitive with the very best. Remarkable at six and seven years old under Delphine Perez, he began his international career in 2013 under the saddle of Penelope Leprévost with a view to preparing for the high level. His first season saw a 2nd place in the Grand Prix du Mans (1.50 m), 2nd and 3rd GP Pro1 Le Mans, 6th GP CSI2* Valkenswaard, CSI2* 6th in Vilamoura, placed at CSI3* Dinard... In 2014 he won the 1.55m class at the Antwerp leg of the Global Champions Tour. I Belgium his first sons, aged three in 2012, are approved: Regor Jackson won the approval of BWP, Durban and Jenson Cornemont Van't Meulenhof approved SBS. Vagabond produces beautiful horses, very flexible, with enormous resources and excellent movement. He seems to transmit his power to his products. These qualities, combined with an unerring maternal line, should make him a remarkable stallion.